This letter was written by Pvt. Andrew S. Williams (1826-1864) of Co. H, 38th Ohio Infantry. Pvt. 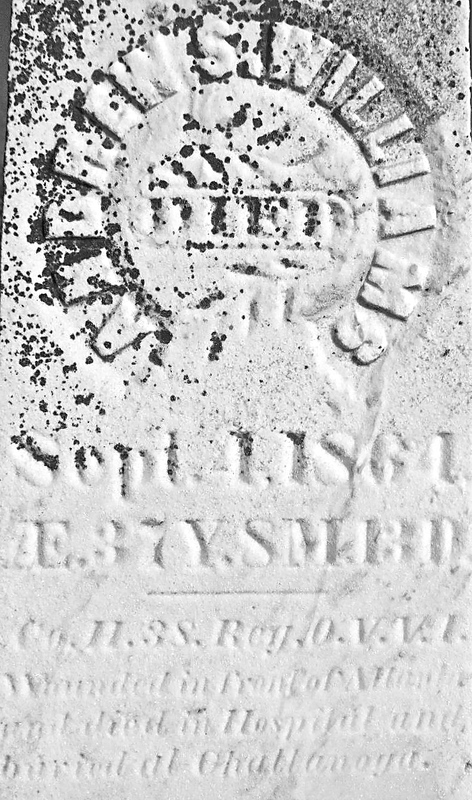 Williams was the son of Charles W. Williams (1799-1882) and Elizabeth Sewell (1806-1891) of Superior Township, Williams County, Ohio. Andrew was married to Mary Ann White (1831-1910) in February 1851. By the time of the Civil War, the couple had four living children. 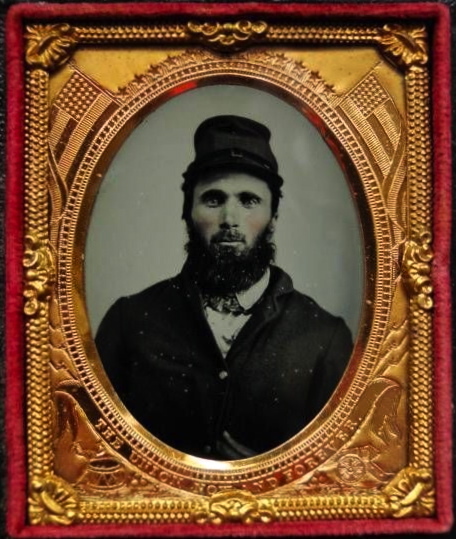 Also serving in the same company with Andrew was his younger brother, Abner Williams (1838-1864). Unfortunately for Pvt. Williams’ family, neither Andrew nor Abner survived the war. Abner was killed and Andrew was wounded in the Battle of Utoy Creek on 7 August 1864 — not far from Atlanta, Georgia. Andrew died a month later in a Chattanooga hospital. 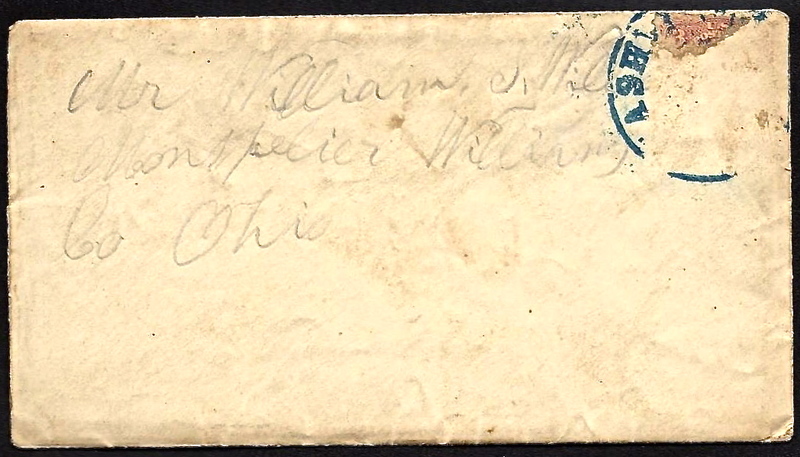 Though intended for all of his family to read, Andrew addressed the envelope of this letter to his brother, William S. Williams (1830-1909). I take this present opportunity to inform you all that I am well at present and has been pretty hardy ever since I got well of the ague at Danville, Kentucky, and Abner is well also and he is fatter now that I ever saw him and I am heavier than I ever was before. We have plenty of paper and envelopes and money to buy them with so far yet and we have plenty of stamps so far. We can get plenty of paper and envelopes here for one cent a sheet but we can’t get stamps without sending to the Union states for them. If we pay the money on postage, we have to pay 5 cents because their least change is 5 cents. I received yours all in one envelope a few days ago which was dated March the 18th and also I received 2 from Mary Ann at the same time and I read them with pleasure. I am always glad to get a letter from any of you. we are getting pretty well through Tennessee. We are near Columbia and Duck River. We think that we are going to Decatur, Alabama. We think there will be a battle there if the rebels don’t run. We have not been in a battle yet but the rebels runs before us and burns all the bridges they can and we build them up again as fast as we can and cross over on them. The Union troops are thick here as you ever saw black birds in Williams County. We have moved since I wrote to Mariah White. We go to bed with the beating of the tattoo — that is at 8 o’clock at night — and get up in the morning at the beating of the reveille in the morning — that is at 6 o’clock. Then every fellow has to jump. We have plenty of music here. We have the brass band and the fifes and drums. I expect we will march tomorrow again. We marched yesterday and we are laying still today. As for the ending of the [war] you know about it as do if you read the papers, but I think it will be to an end this summer some time but when it is to an end we will know it if we live to see it. We are talking of sending our overcoats home since it has got warm. Tell Uncle Samuel’s girls that I will send them a letter as soon as I can. When you read this, let Mary Ann read it. This entry was posted on Thursday, May 1st, 2014 at 3:12 am	and posted in Uncategorized. You can follow any responses to this entry through the RSS 2.0 feed. I was thrilled to see the letter from Andrew S. Williams. The letter was addressed to my great, great grandfather William Williams. We have some other Civil War letters from both Andrew and Abner, very graphic descriptions of battle scenes. Do you have any more letters from Andrew Williams? If so, we would be very interested in knowing the content of the letters. I’m going to see my Mom this weekend. I ask her about the letters. It’s been a long time since I looked at them.